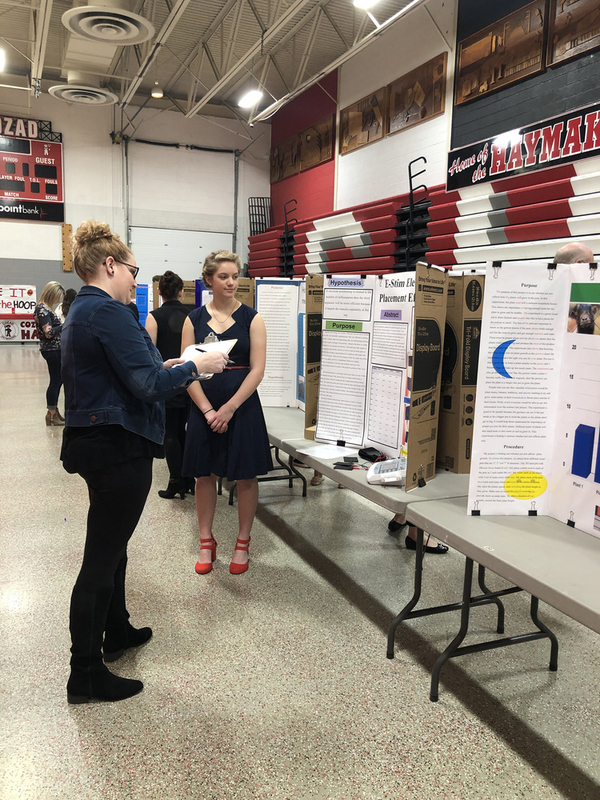 Cozad High School held their first Science Fair for CHS junior and senior students in Mr. Brummer’s Chemistry classes and Mrs. Johnson’s Anatomy class on Monday, January 14, 2019. Students in these classes have been working on their projects since the beginning of November and today they were able to present their work to judges. Mr. Brummer and Mrs. Johnson feel the Science Fair is a great way for students to see the process of science. Students had to create hypotheses, test their hypothesis, create experiments, collect data, and compile their information and present it to others. The students learned how to “do science”. Mr. Brummer also added that when he was in High School he won a scholarship that helped pay his way through school and even though this Science Fair did not offer scholarships, it gave the students the experience that perhaps they could build on that. All students presented their projects to five judges. Judges included Mr. Jim Terry, Mrs. Sheena Kinnan, Mr. Bruce Hird, Mr. Dave Evertson, and Mrs. Bailey Koch. After the preliminary presentations, 13 students were then chosen for round 2 where the judges had the opportunity to ask questions and more detailed information. Prizes were donated by local businesses and were used for top 6 places and for some “fun” recognition for Most Artistic, Best Female Hair Scientist, and Best Male Dressed Scientist. We would like to thank the business donors and the judges for supporting our CHS students and science department.